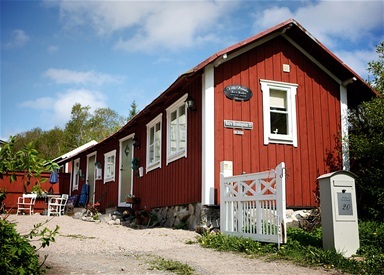 A small newly renovated cottage (30 sqm) from the 19th century in the cenral parts of Vaxholm. 1-4 beds, bedroom, kitchen/livingroom, bathroom with shower and WC, TV, garden, barbeque, parking. Babychair to lend. 50 m to the sea. About 300 m to Vaxholms city. Good boat/buss connected to Stockholms city. For rent all year around. No smoking/no animals. Price includes sheet and towels, Coffee/Tea and fruitplate, self households. Check-in at earliest 2.00 pm the day of arrival. Check-out at latest 12.00 am the day of departure. We are looking forward having you as our guest! Possible to book private lesson in waterski/wakeboard!